For many people a holiday in a spa is an agreeable relaxing luxury. To others, mineral water, mofettes (natural sources of carbon dioxide), and mudbaths are the compounds of a thorough treatment for aches and pains. To both kinds of visitors Romania can be quite a miracle. Prices are very reasonable and no less than 3,000 mineral and thermal water springs are located here. The country has 70 health resorts, some founded by the ancient Romans. Today patients come from all over Europe to receive therapeutic care from specialists in well-equipped clinics of the leading spas, while enjoying their magnificent holiday locations. The main spas offer relief for rheumatic and cardio-vascular diseases, respiratory ailments, various disorders of the digestive and nervous system, and dermathological and gynaecological problems. All treatments are conducted under strict supervision by the official Institute of Physical Medicine, Balneology and Medical Rehabilitation. The normal length of a stay at a spa is of two to three weeks, at the end of which you are given a full medical bulletin, including diagnosis, the results of tests and recommendation. If you feel miraculously better afterwards, it's because treatment is methodical and performed skilfully. The most renowned health resort is Baile Herculane, established by the Romans in the wooded Cerna Valley in the southern Carpathians, an idyllic site. rheumatic, nervous and nutritional problems. lumbago as well as gynaecological and nervous disorders. extraordinary heliothermal lake, called Ursu. deeper down than it is at the surface! for rheumatism and peripheral nervous disorders. 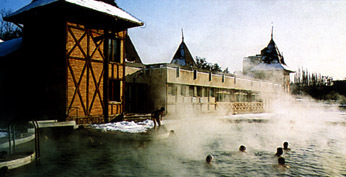 There are numerous health resorts in the mountains. Sinaia, near Brasov, is a sought after holiday centre. Tusnad, north of Brasov, by a calm and picturesque lake, is important for bicarbonated and gaseous mineral waters and mofettes for treating cardio-vascular diseases. 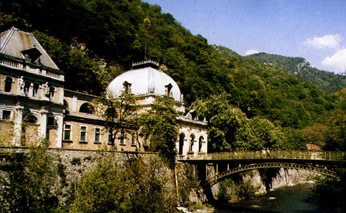 The French Emperor Napoleon III received water from the Olt Valley in the southern Carpathians; today its twin resorts of Calimanesti and Caciulata heal disorders of the digestive tract and kidneys in the elegance of Belle Epoque balneary pavilions, combined with totally up-to-date treatment centres. Nearby, the small spa of Baile Olanesti provides cures for digestive and kidney disorders, gout, obesity and diabetes, again amid fine mountain scenery. Down on the long sandy beaches of the Black Sea, and endowed with all the holiday attractions there, are the spas of Eforie Nord, Eforie Sud, Neptun and Mangalia. Eforie Nord is the most important. All utilise the fine, smooth, sapropelic mud from Lake Techirghiol to tackle skin problems and rheumatic, post-traumatic, and gynaecological problems. Thalassotherapy is also available. Thanks to heated treatment centres, these spas stay open all year round. No account of Romania cures would be complete without mention of the therapy pioneered by Dr Ana Aslan. This utilises the biotrophic properties of two products, Gerovital H3 and Aslavital, to postpone ageing. Beauty care gives finishing touch! In particular the therapy counters memory loss, improves blood circulation in the brain and helps revitelise the internal organs. It is available as an additional treatment at most Romanian Spas, as well at the specialised Otopeni Clinic outside Bucharest and the Flora Hotel in the capital itself. Finally, for more information about the many curative programmes in Romania, write to ONT "Carpati" S.A, 7 Gen. Magheru, Bucharest, phone: 021-6145160, fax: 021-3123907. "Litoral" SA, Mamaia, Bucharest Hotel, phone: 0241-831152, fax: 0241-831276. "Felix" SA, Baile Felix, phone: 0259-261338. Or to Romanian Tourist Information Offices abroad.